Meatloaf is one of my favorite meals, full of healthy vegetables and flavor, it is pretty much a one-stop-shop for everything we need and crave. But the meatloaf I make is far different from the soggy mess that my mother used to make. There wasn’t enough ketchup to make it palatable to me. The only time I actually liked her meatloaf was when she forgot it and it got really crunchy on the edges. Today is Meatloaf day at the Food Network’s Comfort Food Feast and a group of talented bloggers and food writers are sharing their interpretation of this classic with all of us. I can’t wait to see what everyone has to share. Make sure you check out the links at the bottom of the page! Uncooked meatloaf ready for the oven. One of the things I do differently is that I do not use a loaf pan to cook the meatloaf. It doesn’t need it. I form the mixture into a loaf shape on a baking sheet and pop it in the oven. The entire surface is exposed to the heat and develops a lovely crunchy crust. I also do not add breadcrumbs or an egg making this naturally gluten-free and casein-free. Because of the lack of fillers, this is an extremely meaty meal, full of protein and quite filling. Any leftovers you have also make fantastic sandwiches the next day! Fresh from the oven. Make sure you use a baking sheet with sides to hold in the cooking liquids. My mother, as wonderful as she was, didn’t enjoy cooking and did it because she had to. Cooking was a chore for her and she never used any seasonings beyond salt and pepper. I grew up learning from my grandmother and became enamored with cooking and baking. I loved the idea that adding herbs and spices could completely change the flavors of ordinary foods, elevating them to meals that my family applauded. My father was thrilled when I started making meals for the family and reading cookbooks like others did the classic novels. Cooking became my personal form of science experiments. A healthy and comforting meal good any time of the year! 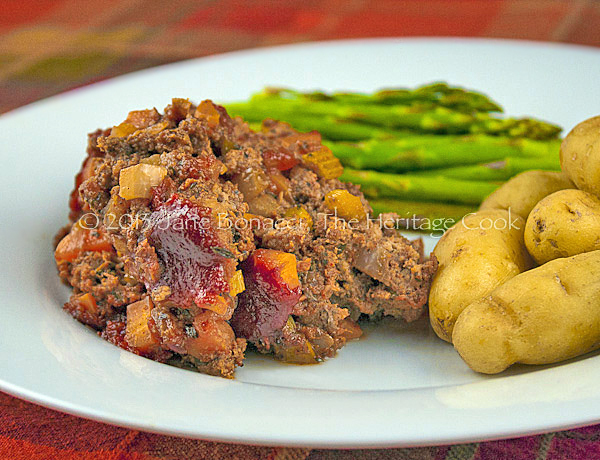 If your kids don’t like eating vegetables (like most of us when we were young), they will get a full serving in this delicious meatloaf because the vegetables are combined with the meat. If your children are so picky that they will meticulously remove each visible piece of vegetable, there is a way around this. Sauté them as directed but use a saucepan with tall sides. Add a little of the tomato juice to the pan and use an immersion (stick) blender to puree the vegetables. Fold this into the meat mixture for all of the healthy benefits without children being able to see chunks of vegetables! When I was making this meatloaf I didn’t take the time to very finely chop the vegetables as I should have. Consequently my meatloaf tended to fall apart and didn’t give me neat slices. But who care how it looks as long as it turns out as delicious! I hope you give this meatloaf a try. It will make you reevaluate the old classic and hopefully will become a standard for your family dinners in the future. Preheat oven to 350°F. Spray a baking sheet lightly with non-stick vegetable spray. Set aside. Combine seasoning mix ingredients in a small bowl and whisk to thoroughly blend. Leave out the ancho chili powder if you are cooking for children or for those with sensitive stomachs; set aside. In a small bowl, cover the sun-dried tomatoes with boiling water. Set aside to rehydrate for 5 to 10 minutes. When plumped, strain, squeeze out excess liquid, and chop finely. Set aside. In another small bowl, whisk together the ketchup or chili sauce with the pomegranate molasses and salt. Taste and adjust it to your preference. Set aside. Heat the oil in a skillet over medium heat. Add onions, peppers, celery and carrots and cook, stirring often, until softened and beginning to turn golden brown, about 5 to 6 minutes. Add shallots, the sun-dried tomatoes and 2 tbsp of the seasoning mix. Cook, stirring often about 2 minutes or until shallots are softened. Remove from the heat; transfer vegetables to a large bowl to cool. When cool enough to handle, combine the cooked vegetable mixture with tomato juice, blending well. Add the ground beef and remaining seasoning mix. Use your hands to incorporate everything thoroughly and evenly distribute vegetables and seasonings. Transfer the meat mixture to the prepared baking sheet. Press into a free-form loaf shape about 3 to 4 inches high, compacting slightly. Brush the top with ketchup or chili sauce if desired. Place in the oven and bake for 30 minutes. Spin the sheet so that the front of the meatloaf is now facing the back of the oven. Continue baking for an additional 15 to 20 minutes or until an instant read thermometer inserted in the center of the loaf registers 160°F to 165°F. Remove from the oven and let rest for about 10 minutes while you finish making the rest of the meal. Cut into 1-inch thick slices and serve with roasted or mashed potatoes and steamed broccoli or peas if desired. Check out these other recipes from some of the web’s most talented writers and recipe developers! I love all the veggies in your meatloaf Jane! Great idea pureeing them – I’ve never tried that, but do add sauteed chopped vegetables that brings out their natural sweetness and adds moisture to the meatloaf. Love the pomegranate molasses in your glaze too.